The holidays are filled with parties, and nothing gets a party started quite like a great appetizer. 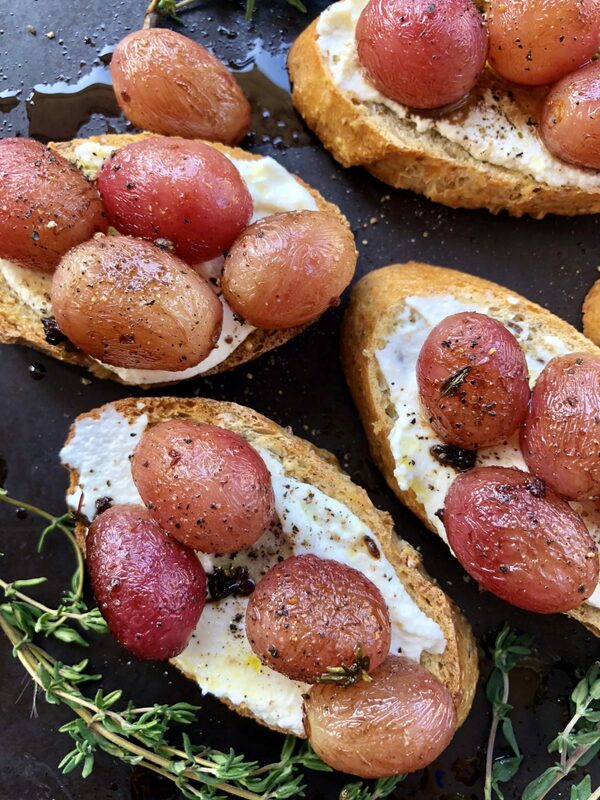 Whether you are hosting a large group at home or need an easy holiday appetizer that travels well, this Roasted Grape and Ricotta Crostini should be at the top of your list. Far from ordinary, this tasty recipe will get your gathering off to a memorable start. 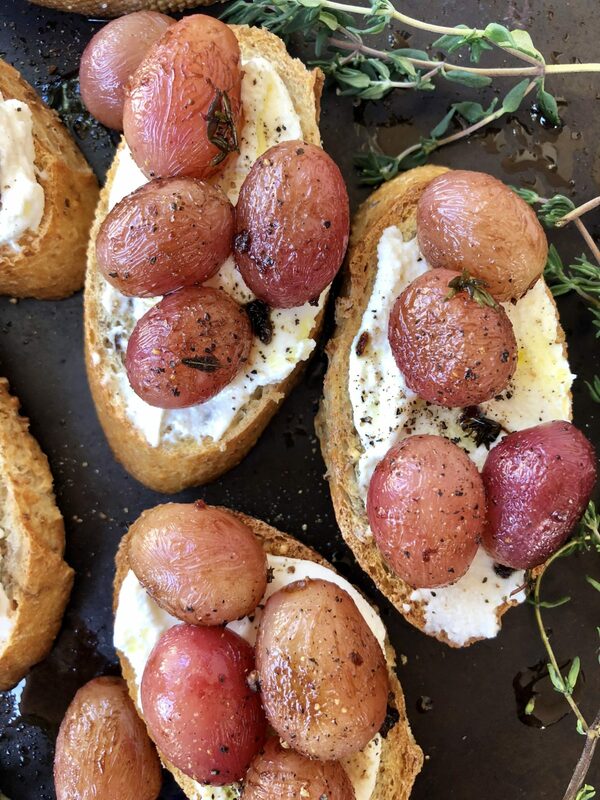 Since my last crostini recipe was such a hit – I created another scrumptious recipe that is just as simple, and just as delicious. Serve with champagne for a festive bite! Roasting the grapes develops the flavor, and brings out the sweetness. The grapes become really juicy on the inside, and when paired with the balsamic vinegar it gives it a nice sweet and tangy flavor as well. The ricotta is soft and creamy and makes a wonderful blanket on the toasted bread. Cut the baguette slices relatively thick (about 1/2 inch) so the crostini is easy to pick up and stays intact, when you eat it with your hands. This recipe tastes best warm, but the great thing about it is that you can roast the grapes in advanced (re-heat before serving), and just assemble the rest of the recipe right before you want to serve them. Preheat the oven to 400°. On a parchment paper-lined baking sheet, toss the grapes with the vinegar, thyme sprigs and 2 tablespoons of the olive oil. Season with salt and pepper and toss to coat. Roast for about 15 minutes, stirring occasionally, until the grapes are softened and the skins start to pop. Meanwhile, brush the baguette slices with the remaining 1 tablespoon of olive oil. Arrange on a baking sheet and toast for about 8 minutes, until golden and crisp. To assemble the crostini, dollop 1 tablespoon of the ricotta onto each toast. Spoon the warm grapes on top. Arrange on a platter and top with a drizzle of honey. 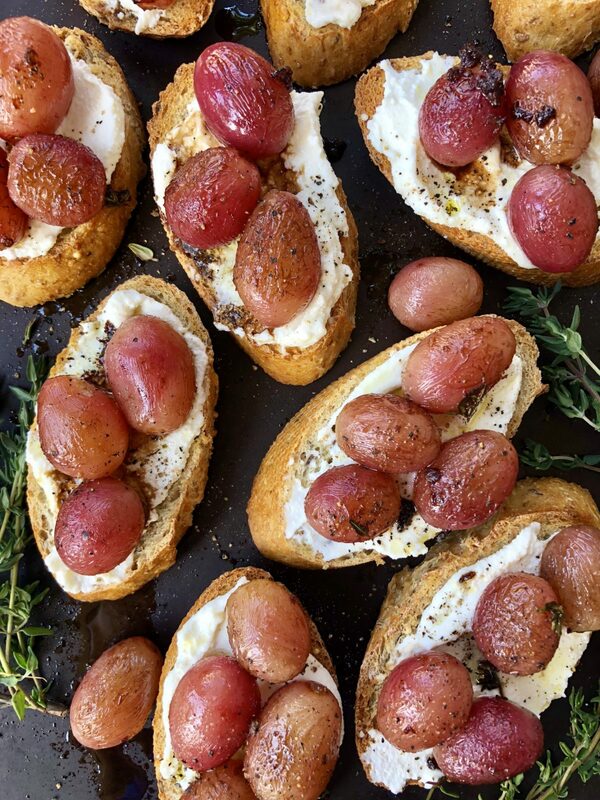 Sprinkle the crostini with salt and garnish with chopped thyme.